The probe's landing site isan isolated volcanic formation located in the northwest part of the Moon's near side. China's Chang'e 5 lunar probe is expected to land in the Mons Rumker region, and to take moon samples back to earth at the end of the year, according to a Chinese space official. Liu Jizhong, director of China Lunar Exploration and Space Engineering Center of China National Space Administration (CNSA), for the first time disclosed the probe landing site, an isolated volcanic formation located in the northwest part of the Moon's near side. Liu also mentioned China's Chang'e 4 lunar probe. Delivering a report at the Global Space Exploration Conference, which opened in Beijing Tuesday, he said China's Chang'e 4 lunar probe, which is expected to be the first human carrying probe landing on the far side of the moon, would be launched in 2018, carrying 11 scientific payloads, including four developed by other countries. He said lunar exploration had many international cooperation opportunities and that constructing the international moon village or international research station, proposed by European Space Agency (ESA), was also a long-term goal for China. "China is planning and designing its future lunar exploration program. We will focus on the south pole region of the moon. The research on water and the permanent shadow area of the lunar south pole region will bring greater scientific discoveries," Liu said. He said that China would push forward international cooperation in exploring the south pole of the moon, constructing lunar scientific research station and establishing long-term energy supply and autonomous infrastructures. 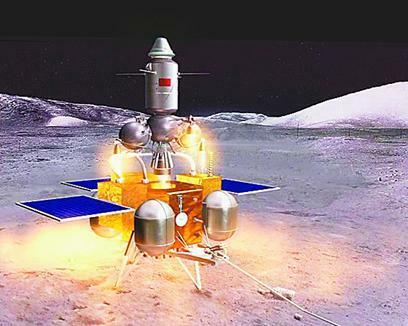 Liu proposed jointly exploring the lunar polar region and constructing the scientific research station as a guide for the international moon village or station, following international law. He also proposed creating an open platform for cooperation in accordance with the principle of "sharing the risks and achievements," and to set up the International Union of Planetary Scientists and the International Union of Planetary Science College Students. He said scientists from different countries might jointly formulate scientific objectives, develop scientific payloads and carry out scientific data research. "Partners may develop probes and facilities independently, which will complement each other. Enterprises are also encouraged to actively participate in lunar exploration," Liu said. "Intergovernmental cooperation should be strengthened, and governments should co-ordinate existing deep space exploration infrastructures to share the resources and enhance investment efficiency." At the conference, Wu Yanhua, vice administrator of CNSA, honored the international partners of China's Chang'e 4 mission, which will carry payloads from the Netherlands, Germany, Sweden and Saudi Arabia. Since China proposed international cooperation on the Chang'e 4 mission last year, China has received more than 20 schemes from other countries. "We support more international cooperation in China's future lunar and Mars missions, as well as exploration to the Jupiter system and asteroids that are still under discussion," Wu said. "It is exactly what I was looking forward to," said Jan Woerner, director general of the ESA. "It will fit perfectly to the moon village, ESA's vision for international cooperation on the moon."